The Mulleavy sisters wear their geek pride on their sleeves, and want us to wear it too. The chic "sci-fi freaks" who brought us their ode to LARPing* (yes, that happened) took us on a trip to a galaxy far, far away. And oh, did we travel in style! Left: Court dresses of a distant planet in a far away galaxy? Or distant prom night memory? Right: Have you seen my childhood? Oh, it's here in Rodarte's butterfly hair clips! Having drawn inspiration from the '70s and their childhood, and reinterpreting it into super wearable, fashion forward pieces with some whimsical twists: that smocked dress you had as a little girl is now studded in Swarovski crystals. That track suit now has a high paper bag waist. And those glittering bowling balls you remember from the alley, they're now glamorous, must-have parkas (gotta give ELLE kudos for that comparison). Finale gowns aside, they are sure to be the most coveted pieces of the collection. Above: Glittering space-age need-it-now parka. A detail of the beautiful crystal embellished smocking on the dresses, via Swarovski's instagram. They're long time collaborators with the design duo. But about those finale gowns: Well, what would a geeky child of the '70s wax nostalgic about the most? Why Star Wars of course! With their soft drapery, crystal accents, and transparent references, they were a fashion obsessed geek girl's dream, (pssst.... that's me!) and probably sparked the highest wave of, "I-must-instagramm-this-NOW-and-tell-EVERYONE!!! ", (guilty) all week... And maybe that was totally their plan. Now I'll be honest here. I was excited to break the news to all my geeky tweetmates, etc. But after everyone and their mother hyping up this collection, I'd figured the message was gotten across. I thought it better to focus on other geek inspired collections as the story of Star Wars at fashion week had been done to death. That is until yesterday... when it happened again. Darth is all over these PREEN girls. Did you guys miss Darth Vader at New York Fashion Week? Fear not, for he just made an appearance in London at the Preen show. The legendary villain was on a slew of pieces including beautiful printed dresses and the greatest button down shirt that I NEED in my life!! !-- thanks to Disney approaching the design duo of Thea Bregazzi and Justin Thorton for a collaboration. And while it does make sense that Vader would want a show all to himself, backstage was an entirely different matter altogether. For where there is a big name, there is an entourage.... or an army. 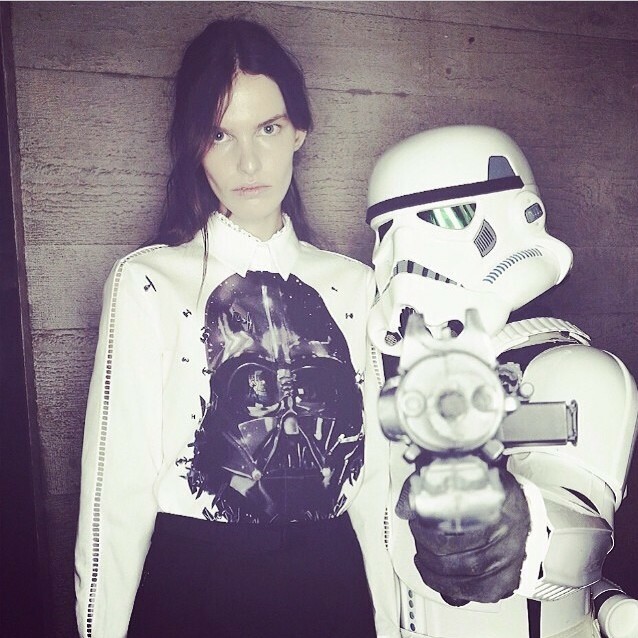 That's right, the Stormtroopers were on hand to, er... vogue with guard the models backstage! Now, geek references in high fashion may not be for everyone (not to say that she doesn't have a point), but I will say this: if "sci-fi chic" is a "trend" to the newly indoctrinated fans thereof, I will tell them here and now that it is never going away. The force is strong with this one. What do you think? Is geek chic a "hot new trend?" What favorite characters would you like to see depicted on the runways? *I plan on devoting an entire post to the geek fashion history, and my love, of Rodarte. Keep your eyes on this blog for the full retrospective. ** My images are fresh off Style.com unless otherwise noted.